41 magnum ammo made its debut in the 1960’s as the ultimate police revolver caliber. The 41 Magnum was touted by enthusiasts and firearms experts like Elmer Keith, Bill Jordan, and Skeeter Skelton. The cartridge was designed to give police officers a more compact magnum cartridge than the 44 Magnum, but something larger than the 357 magnum and 38 special cartridges that dominated the revolver market at the time. The 41 Magnum cartridge was only adopted by a few police agencies, the round excelled performance-wise. The 41 Magnum became a cult favorite in terms of defensive calibers, but is also a favorite as a hunting round. 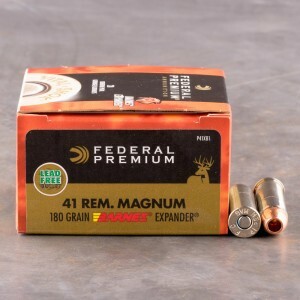 Much more powerful than the 357, but tamer than the 44 Magnum round, the 41 Magnum makes an excellent field gun for self defense against pests and even larger animals like bear. There are a variety of different large frame revolvers chambered for the round, some designed for hunting and long distance shooting and others designed for self defense. 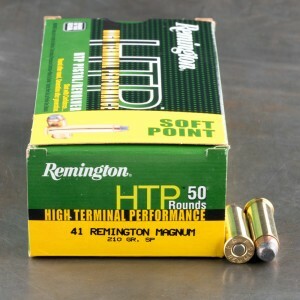 I have purchased this ammo several times and will buy it again. Great ammo, great quality. I have achieved good tight groupings of to 100 yards. Excellent. Very tame recoil but, super accurate. Very pleased with this ammo. Good quality ammo.Very tight groups at 25 yards. Accurate and hard hitting great price. Very well worth it. Will definitely buy again.